Explore the Baker's Tank trail this summer at Race #3 of the 18th Annual Summit Trail Running Series. The Series consists of 6 trail races in and around the Breckenridge area. 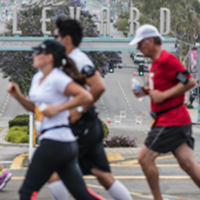 Each race features a short and long course, and all races are open to runners of all abilities ages 10 and older. Race #3 is Baker's Tank with a 7K short course and a 11K long course. There are no aid stations on the course - this Series is cup-free. Participants MUST bring a reusable water bottle. Please note, Breckenridge Free Ride buses take race participants to and from the trail head for the race - there is no parking at trail head. Limited parking at the trailhead. Breckenridge Free Ride will take runners from the Stephen C. West parking lot to and from the race.